With the original North Eastern Railway (NER) Tyneside stock requiring replacement in the next few years, the LNER reviewed Tyneside electric services in 1933. In June 1934, the Locomotive Committee agreed to the construction of ninety new vehicles and the renovation of the 1920-2 NER stock. In 1935, it was decided to electrify the South Tyneside line to South Shields and operate it with the renovated stock. Hence the order for new passenger stock was increased to 132 vehicles to operate all of the North Tyneside services. 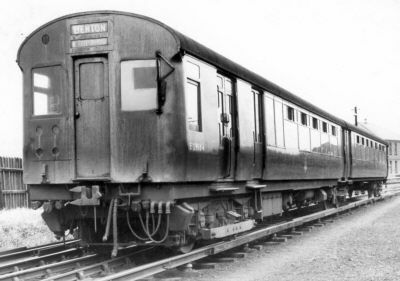 Orders were placed with Metropolitan-Cammell Carriage & Wagon Co in June 1935. Tender bids were also received from Gloucester Carriage & Wagon Co and Birmingham Carriage & Wagon. Gloucester were busy constructing London Transport R-Type stock for the District Line and over-priced their bid. Birmingham's bid was also high, but it was also felt that they lacked experience constructing electric rolling stock. Westinghouse supplied the electrical control equipment, and Crompton Parkinson supplied the electric motors. The passenger stock consisted of 64 twin-coach articulated units (two coach bodies on three bogies). Two motor parcels vans and two luggage motor thirds, were also ordered. The vehicles were delivered in 1937, and they first entered service on 30th July 1937. Metropolitan-Cammell designed the new vehicles following specifications written by Gresley. Riveted steel coach bodies were built integral with welded steel underframes. Internally, they were built with an open layout divided into two saloons. Various accommodation layouts were built. The sides of the coaches had large non-opening windows with sliding ventilators. Single manually-operated aluminium alloy doors were fitted at each end of each vehicle. Luggage compartments were fitted with double sliding doors. Pairs of bucket-type seats were fitted on either side of a central aisle. Each twin-coach unit was fitted with three different types of bogie. The outer end of the power car was fitted with a powered 8ft 6in wheelbase motor bogie. The other two bogies were unpowered with an 8ft wheelbase. These were a double-bolster version of the Gresley 8ft 6in bogie design with heavy-duty axle journals and axleboxes. The trailing bogie was of a lighter construction based on an updated Fox-type pre-Grouping design. The motor bogie was fitted with two 216hp axle-mounted motors with 71:18 gears. The motors usually operated in parallel with 60% full field, resulting in a balancing speed of 55mph. Cowhead couplings and electro-pneumatic brakes were fitted. In common with the earlier NER-designed stock, buffers were only fitted to the luggage and parcels vans. A foot pedal in the driving cab operated air sanding equipment. Despite using the same couplings as the earlier NER-designed stock, the electrical control and braking systems were different and the two types of stock could not be used together. In contrast to the LNER teak livery then in use, the new vehicles were painted in the original NER red and cream Tyneside livery. This red livery proved to be particularly visible when illuminated with arcing at night. After complaints by the RAF, the vehicles were repainted in Marlborough Blue and Quaker Grey in 1941. This helped, but arcing from the collector shoes remained a problem throughout the black-out conditions of World War 2. British Railways (BR) later repainted the stock in green during the 1950s. The new stock was generally a success, and was capable of faster running. The main circle of 20.6 miles was timetabled at 53 minutes, compared to the previous timetable of 63 minutes. Twin-coach units could be connected, and trains typically consisted of 2,4,6, or 8 cars. The first withdrawal was set Nos. 24229/30 which was destroyed by incendiary bombs that hit Monkseaton Carriage Sidings in the early hours of 10th April 1941. The set was withdrawn from South Gosforth Car Sheds a few months later. Driving Trailer No. 29312 and Driving Motor No. 29131 collided at Newcastle Central on 17th August 1951, and they were withdrawn from service. The surviving halves of these two sets (Motor Third No. 29112 and Trailer Third 29231) were united to form a new twin set. No. 29112 was renumbered as No. 29131 for consistency with the numbering system being used. In 1951, two Luggage Motor Third double driving (LMD/3) cars were converted into Perambulator Vans. These were originally built to be used with a 6-coach controlled set. Side wooden seats replaced twelve of the upholstered seats in the third class saloon. The door to the luggage compartment was widened, allowing prams to be pushed into the luggage compartment. Unlike the NER Tyneside Perambulator Vans, these cars retained their motors. They were also used as spare motor luggage vans and for hauling electric stock between Gosforth Car Sheds and Walker Gate Works. Both cars were withdrawn in 1967. Withdrawals of the regular Tyneside stock began in 1963 when there was a drastic reduction in the North Tyneside services. 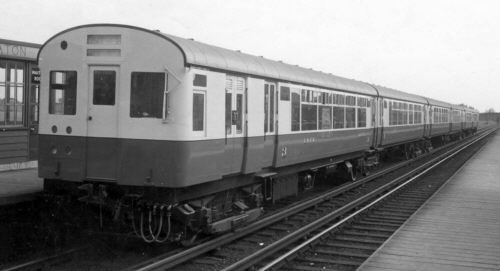 Fifteen two-car units were withdrawn in 1963. Initial withdrawals were of two-car units with only one cab. Units with two cabs allowed more flexible operations and were kept. The North Tyneside electrification was completely abandoned in 1967. Withdrawal of the remaining cars was started in spring 1967, and the last service ran on 17th June 1967. These were the last examples of articulated LNER stock in operation with British Railways. The only surviving piece of NER or LNER rolling stock from the NER Tyneside system is the de-icing van No. 900730 (ex-23267), which is owned by the National Collection. This is the last surviving example of clerestory roof electric rolling stock. It was originally built by the NER but converted into a de-icing van by the LNER. A BR-era Tyneside 2-EPB set also survives. This was built in 1954 along Southern Railway lines. The set (car nos. 65321 & 77112) are both owned by Suburban Electric Railway Association who are currently restoring them. I am not aware of any models of the LNER Tyneside electric multiple units in any scale. Thank you to Bill Donald for supplying the above pictures of the LNER Tyneside stock, from the Bill Donald Collection.